My little red-winged blackbird nemesis returns! He’s back! I was running on the Don Valley Trail the other day, minding my own business, when my little red-winged blackbird nemesis dive bombed into my head. Last year I was attacked by a red-winged blackbird in almost the exact some spot on the trail, so I’m convinced he’s my little nemesis. I feel like I should give him a name like Adolpho or Rothbart (something gothic sounding). This is what Adolpho looks like. 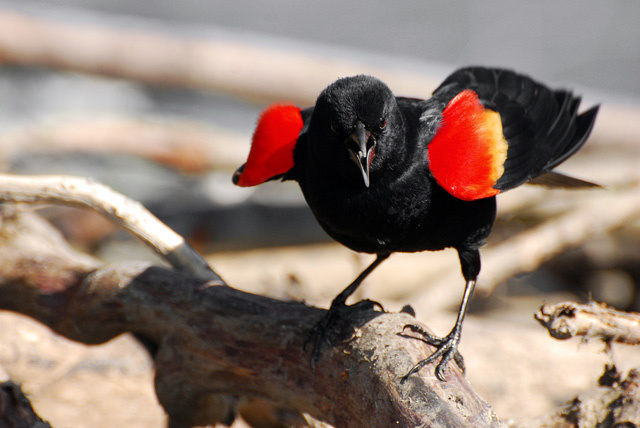 Photo Courtesy of The Torontoist, who also ran a story on red-winged blackbirds a few years ago. He certainly has a penchant for drama! Sitting in the tree, making noises at me before swooping, black wings with those beautiful red tipped feathers outstretched and swooping down to bounce off of my head. Even though he’s small (only weighs about 2 ounces), he sure knows how to strike fear into the hearts of unsuspecting runners, walkers and bike riders. The second time he attacked me over the weekend I saw him attack a runner ahead of me. Since Magpies don’t attack if you stare at them, I thought I’d try slowing to a walk and looking little Adolpho in the eye. This only seemed to make him angrier because he looked at me, cawed (or whatever noise it is he does) and swooped at my head, causing me to scream in panic and run away. Another runner saw me and told me that they always swoop at her neck due to her neck piercings, and that there’s another one outside Riverdale Farm that always attacks. That’s good to know. When Adolpho dive bombs me he basically looks like this. After looking on the Internet I thought maybe the colour of my shirt might affect the red-winged blackbirds. I was wearing my yellow Sporting Life 10k shirt every time I was attacked, and Dan was wearing a red shirt when he was attacked. Maybe red and yellow make them angry? I tried going onto the trail the next day and they didn’t attack me, but they attacked a runner going past me (twice). He also wasn’t wearing red or yellow. So there goes that theory. Even though I almost feel like I have post traumatic stress disorder (I keep dreaming about little Adolpho swooping at my head, which doesn’t help my already intense fear of birds), I’ve decided that this year it’s not going to keep me from my favourite running trail. Plus in retrospect my attack wasn’t too bad. He didn’t keep swooping after me (he only attacks me once and lets me run away in panic) and he just kind of bounced off my head. If I don’t know it’s coming it actually isn’t too bad. It just feels like something hits my head and there’s a buzzing noise. So now I’m trying to relax and trying to brush it off when little Adolpho dive bombs my head. It is getting a little unnerving though. As I run through that stretch of the trail now all I can hear is Adolpho calling for me (and this only makes me run faster in fear). At least I’m not alone. And at least Adolpho isn’t as mean as the red-winged blackbird terrorizing people on Parliament Hill. that was a cute story, love the cartoon, amazing what a 2 ounce little bird can do to a 100 pound human, lol.